The Hotaches Committed series of films are now a raptly anticipated event in the climbing calendar year, and this new film, featuring five 'incredible climbing stories' is the best yet. The quality of production is superb and the film stories are future treasures of climbing documentary. They followed some high level traditional UK climbers throughout the year and the viewer is treated to an armchair sauna of the fear, trauma and elusive elation of high-end climbing. The choice of stories is apt and varied. 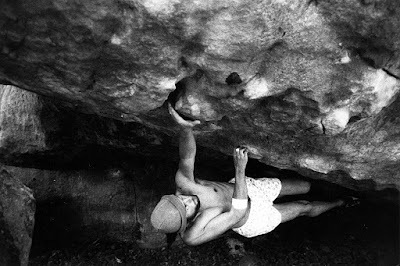 The first story begins with the thoughtful James Pearson attempting the 'last great problem' of The Groove at Cratcliffe Tor. 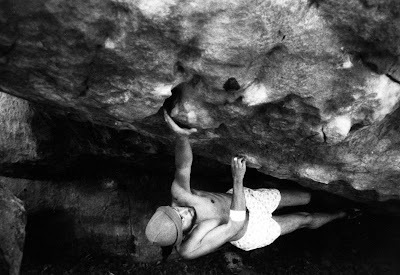 This blank groove between two gritstone breaks was always deemed unclimbable but this did not deter James, he is filmed clutching a pebble the size of a peanut, rapt and intent... so this first film leads us gently into the microscopic obsession and invisible geometry of a climbing magician. The bizarre sequence of moves that James finally pulls out in a dangerous situation is a taster for what is to come in the movie. Film 2, The Allrounder, follows the year of Dave MacLeod, who needs no introduction. 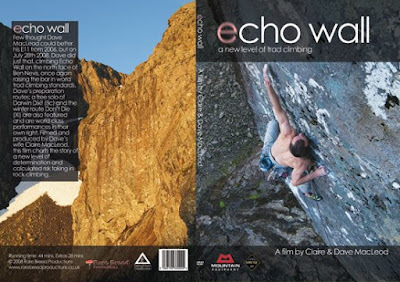 The film captures the olympian levels of commitment and training that Dave must go through to operate at the highest level in each climbing discipline. 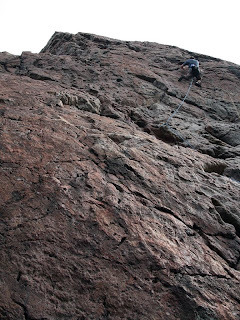 It focuses on Dave's methodical and scientific breakdown approach, how he whittles a route's danger movement into a shape that is manageable for him both mentally and physically. Some of the footage is incredible indeed, especially the stomach churning insecurity of an attempt on the hard mixed climb of The Hurting, where Dave takes a sudden fall into the abyss and we are left wondering about the outcome until a rather relieved post-credits sequence! Dicing with death is an essential part of a climber's make-up and Dave explains how he travels the world preparing for portentous trad routes: training in Spain, repeating other hard routes with apparent ease, such as If 6 Was 9, a notorious Birkett route from the Lakes. This film is enlightening and shows the hard work and sacrifices of a climber attempting to maintain the highest levels in a largely unrecognised 'sporting' event. Film 3 - Grit Kids - is the new generation of trad climbing, showing the natural and unfettered enthusiasm of youth on 'God's Own Rock' (grit). The 'kids' are the Whittaker siblings, whose flexibility and maturity on rock allows them to pull off some of the most incredible new grit ascents. Pete Whittaker turns his flexible mind and body to the contortionist's nightmare that is his own new route Dynamics of Change, a long-sought solution to the Braille Trail direct start. It was inspiring to see the kids approaching hard and dangerous extremes with an understanding rather than bravado and recklessness. Katy Whittaker's ascent of Kaluza Klein is just as eye-popping and thrilling! 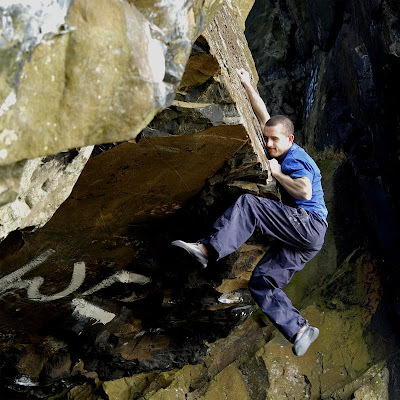 Film 4 is a shorter one, following Steve McClure on his cool and quick repeat of Rhapsody at Dumbarton. This we may have seen before on E11, but the fall from the top moves is still a real gasper! 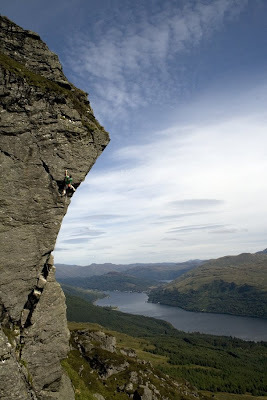 Steve made this route look so doable and the moves so fluid, I went to the cupboard to get my sports ropes out. 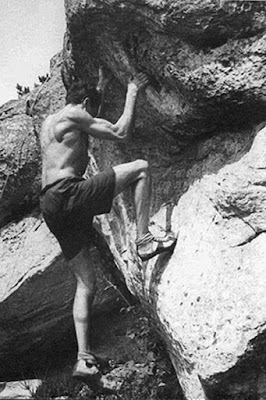 An inspiring sequence on the benefit of pure fitness in climbing, not to disrespect Steve's sheer talent on rock. 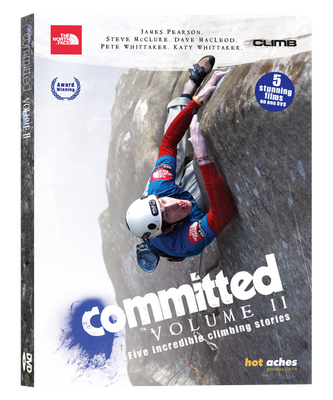 All in all, this is a an essential DVD for any climber's collection and one to return to when you are needing some inspiration for pushing your own limits! Well done to the Hotaches team, you can buy the DVD from their website HERE. At last! 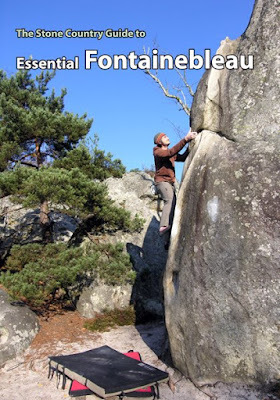 The Stone Country Guidebook to ESSENTIAL FONTAINEBLEAU is now available! The main issue with publishing a guide to the best 350 problems in the forest was actually identifying them. They had to be varied, they had to exhibit character and they had to be good! I enlisted Colin Lambton as editor... with over 20 years of experience, he knew precisely what to put in and what to leave out, though we did have some mighty editorial arguments. 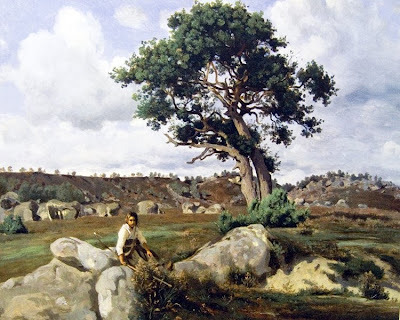 J A Martin was the venue that caused us to come to verbal blows again and again, and Rocher Guichot was finally given a page as I caved to the blackmail of a free pint of beer. Colin I think has done a super job in selecting and balancing the guide and deserves all my thanks for trying to keep the guide on the straight and narrow. 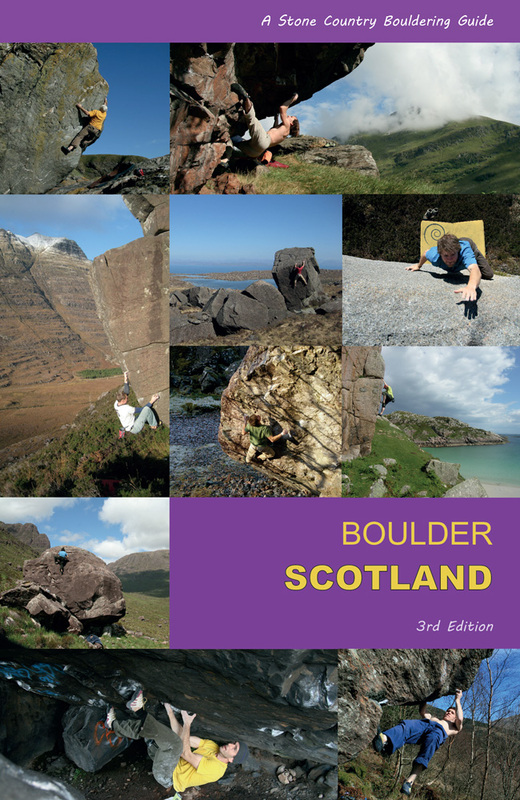 The point was to create a guide mainly for the first-timer which did not confuse and offered a n entry-level to the complexity of Font bouldering, both the technical climbing aspects and the sheer logistical problem of finding some of the boulders! On one trip we had two people on one day approach us with old guidebooks, lost and confused, so we thought there must be room for a pocket book which helped the climber get about better. 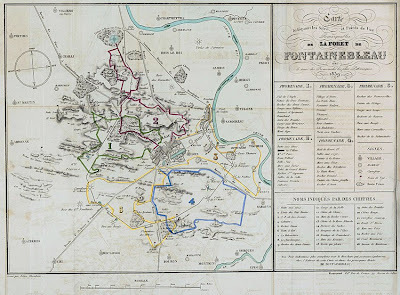 The maps we endeavoured to make clear and to keep to one page. Only the main boulders and obvious well-marked circuit problems were added, and each topo map is orientated as to the direction the climber approaches the area on foot. Orientating to the compass or GPS is in my experience no use as I have yet to see someone with a compass or GPS in hand in the forest, just a lot of folk with guidebooks turned upside-down! The approach notes are extensive as we wanted to get people to the areas as quickly and accurately as possible. Each venue has a detailed approach map and description. On the last research trip I wanted to check a venue deep in the woods and wandered for two miles along the ridges of the red Sentier des 25 Bosses. On jumping off onto an innocuous slab of rock, I slipped on treacherous birch leaves, slid down the rock and tore the ligaments in my left foot. I had to hobble out of the forest with a forked stick for crutch - it was over two miles back to a very welcome pack of Ibuprofen. 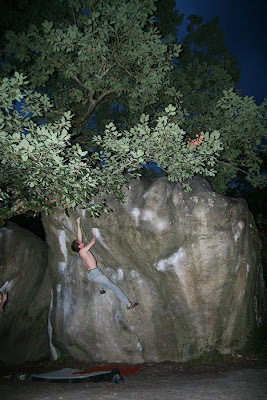 Bouldering's very own Joe Simpson! So after all that time, it's good to see the guide out and I hope people find it useful. It's designed just to help you have a good time and go at some problems you maybe don't know about, so it's very much a ticklist for the dedicated Font boulderer as well as the first-time visitor. 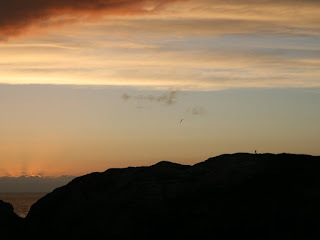 Many thanks to all those who contributed photography and knowledge to the guide. We hope you enjoy your next visit to the world's best bouldering venue! 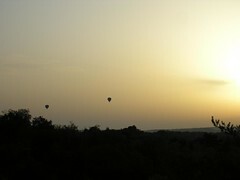 Essential Fontainebleau - Pre Publication offer! 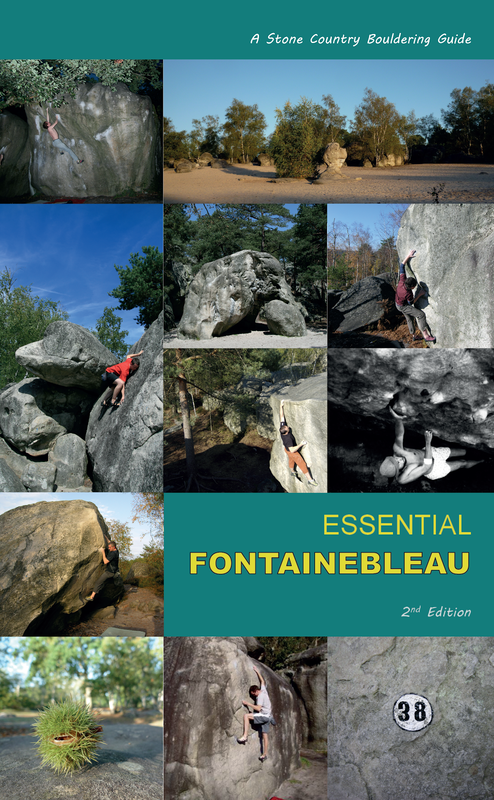 The new pocket guide to Fontainebleau is almost here! The pocket book is full colour with maps, approach notes, photo-topos of over 350 problems and key secrets to solving the problems. 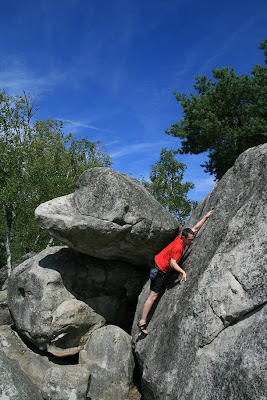 It has been designed to give new visitors to the forest an introduction to the art of bouldering in Fontainebleau, or it can be used by the experienced as a lifetime ticklist of the most-wanted! 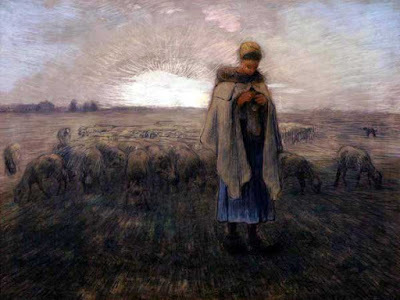 The chosen problems (it was a difficult editing process!) 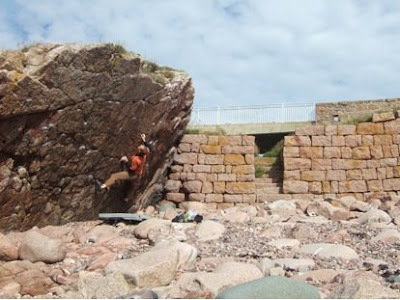 range from 2+ problems through to 8a, but most are in the 6a-7b range and accessible to the on-sighting boulderer (if you are lucky and talented, being plain strong doesn't always help!). The guide will be available late October or early November and as a special offer to those who check into this blog, I'm selling two copies of the new guide with a free copy of Pete Murray's Elements DVD for only 20.00. As the guide retails for 9.99, that's a saving of 15 quid! Plus you get a spare copy of the new Font guide or a DVD to give as a Christmas gift to someone! Those of you who helped contribute photographs will receive a free copy in due course, but this offer is open to everyone. All pre-orders can be done securely through Paypal - simple, quick, you don't need a Paypal account. Just a credit card or Switch! Click on the Buy Now button on the right. I'll email you as soon as the guide arrives and is posted, ready for that winter trip! 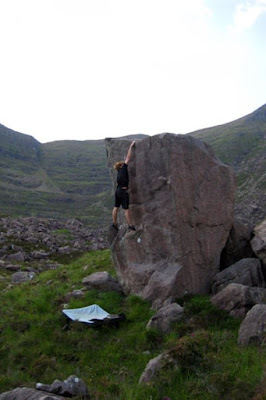 Malc Smith has just climbed the hardest problem in Scotland to date, aptly named Gutbuster and more akin to hard power-yoga without the ground as support! 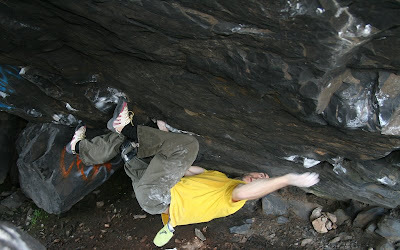 It's a truly sapping excursion through the upside-down caves at Dumbarton Rock and the first problem to break into Font 8b+ territory. It anticipates the imminent arrival of the magical 8c grade as Malc already has spied another link-up that may not survive much longer. 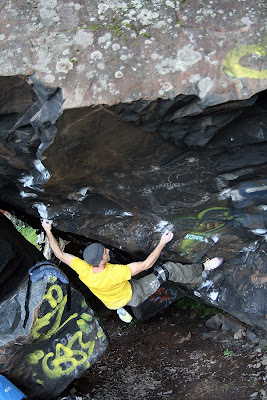 After a long time sitting in the dank BNI through-cave in mild autumn weather, Malc took advantage of a cold and breezy day on 27th September to bite into the angular basalt and complete the problem. 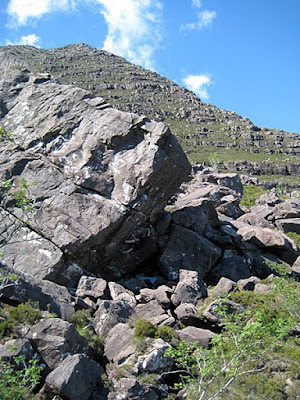 It is an inspiring natural challenge to any highend boulderer, logically linking his own Serum of Sisypus 8a+ through the crux cave sequences of Perfect Crime and up the 8b of Sanction which Dave MacLeod did in 2007. 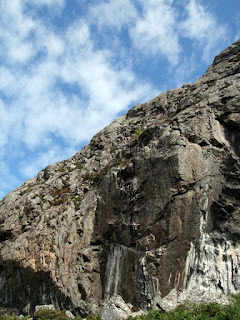 With MacLeod beavering on a possible contender for hardest Scottish problem in Glen Nevis, it was left to Malc to rejuvenate this project, a video of which will be posted by XtraLarge Recordings on this blog, so check back soon! Malc is actually on the 8b+ for about five minutes, 3 of which are an ab-busting upside down rest on a painful kneebar, before committing to the desperate and tenuous hooking and slapping of Sanction, which leads to the mantel onto the BNI slab - the easy bit! 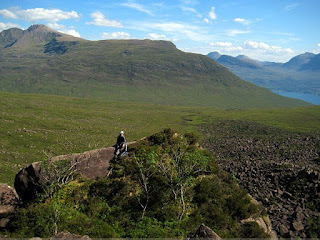 - where he fell off several times on the redpoint before succeeding early on Saturday morning. Congratulations to Malcolm on his continued enthusiasm and success in breaking our bouldering boundaries and bringing them closer to the global benchmarks of the high eighth grades. The far northwest coast north of Aberdeen was always a bit of a blind spot when we did the guide, not much had been developed or found there at all. However, things appear to be changing and after a tip-off from Chris Fryer, Russell Birkett developed the steep wall at the Buchan Ness lighthouse, a full topo is available here. Neptune's Kiss looks like a local classic! 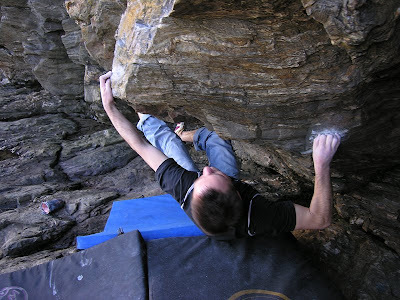 For stamina freaks and sport climbers looking for training problems, look no further than the classic traverse at Boltsheugh, Newtonhill, Aberdeen. 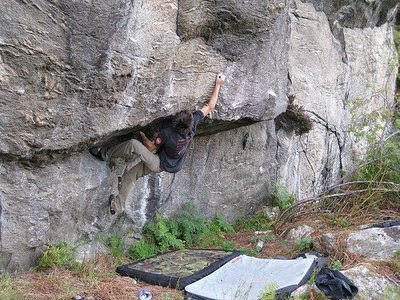 Guy Robertson managed to eliminate as many jugs as he could and ended up with the Newtonhill Powerband, a staggering F8a+ traverse. 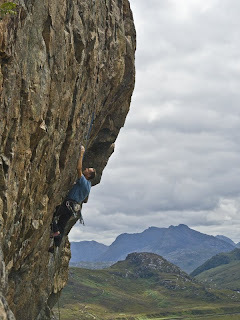 Wilson’s (Moir) low level traverse without any of the jugs / resting holdz. 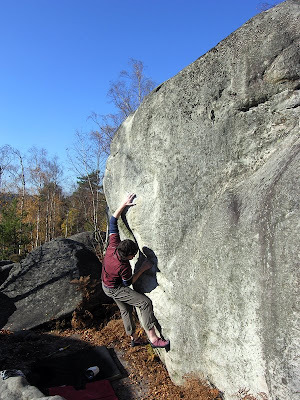 Probably F8a+, whatever that translates to in bouldering money (don’t ask me!). It’s a pretty cool prob, and to my mind cleans up all the many variations on variations that have emerged over the years. The basic rule of thumb is “if you’re wondering if a particular hold is in, then assume it isn’t”! The only exception to this might be the big left-facing side-pull that forms the bottom left edge of the half-way block. 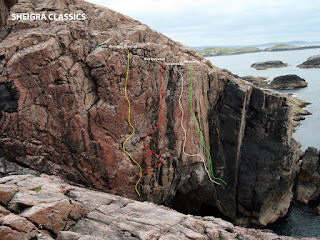 You'll need a guide if you go, but the rule of thumb is good, very similar to the classic traverses at Dumby such as Consolidated and the 'new-Dumby-classic' Shattered F7b+ on the everdry wall (repeated recently by Peter Roy, Jeremy Love and Malc Smith). Just left of this in the through-cave, Malc Smith is currently working an extended traverse from the Serum of Sisyphus start through Perfect Crime and into Sanction... he's been close but not quite, falling off trying to get onto the slab. I doubt anyone will steal this immense problem from under his nose. 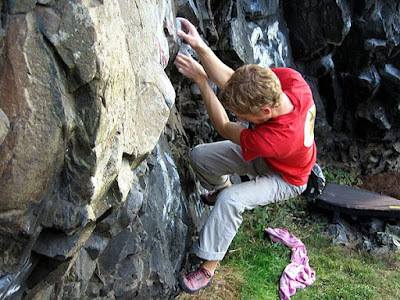 He recently repeated Sanction (Dumby 8b by Dave MacLeod) after gluing back on a crucial block that had shattered off from a fire some one lit under the basalt roof. He also repeated the desperate dynamic sit start to Chahala which he reckons is hard 8a+ and not 8a. 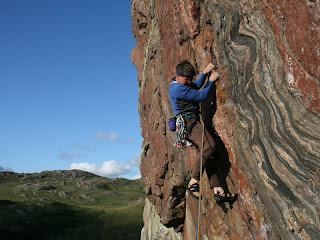 The 'outer circuit' at Duntelchaig has been seeing some great development on some fine-looking steep walls. 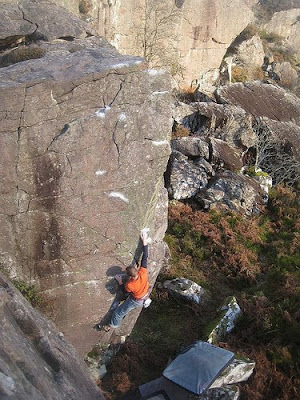 Richie Betts informed me that 'local youth' Mike Lee had succeeded on a nightmarish crimp move on the Knifewound Wall, to give the area another classic 7c... The Settler might even be harder. Richie will be doing us a topo for this soon and it looks like some good clean classics are beginning to appear outside of Ruthven and Brin.